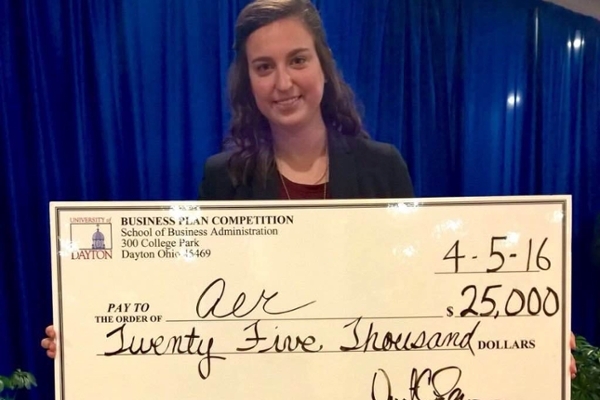 Senior Jessica Kerr won first place and $25,000 for her at-home lung function monitor in the University of Dayton?s 10th annual Business Plan Competition, which is set to expand to Vietnam next year. Kerr’s idea for Aer — a patent-pending device designed to allow people with chronic lung diseases to monitor their lung function at home to determine whether they require a hospital visit — was inspired by her college roommate, who has cystic fibrosis. Kerr said she was also driven by her family members’ experiences, including her grandmother, who died of complications related to her lungs. “I’ve been surrounded by people who get this test regularly at the hospital and have to go through the inconvenience. I wanted to make their lives easier,” she said. The prize money will help move her idea forward and deal with the costs and approvals required to launch a new medical device, she said. Along with the $25,000 cash prize, Kerr will receive free sales training through the University of Dayton’s Fiore Talarico Center for Professional Selling and 15 hours of free legal support from the School of Law’s Entrepreneurship and Intellectual Property Clinic. “The fact that they’re appreciating that powerful women can do big things is amazing. I’m proud to come from a university that recognizes and supports that,” she said. Five other teams participated in the final round of the competition, including a finalist from the new Entrepreneurship in China contest, held at the University of Dayton China Institute. Together, they took home $65,000 in prizes Tuesday. Click here to read more about the finalists. “This year, we had more than 400 people make more than 150 presentations to 15 different judges that covered about 14,000 miles on two continents,” Lewis said. Next year, the University will add an elevator pitch round in Ho Chi Minh City, Vietnam. The winners will compete in a cameo round at the China Institute. And the first-place winners from that cameo round will compete in Dayton for the final round.